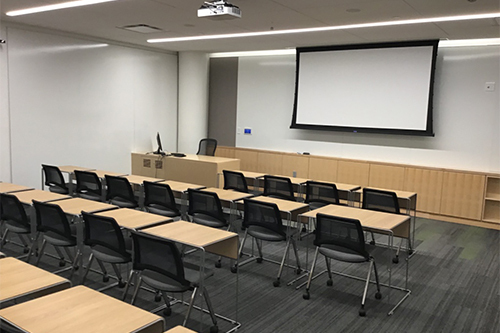 Cambridge College offers class, meeting, and multi-use rooms available for rental at our state of the art Boston Campus at 500 Rutherford Avenue in Boston, MA. Centrally located five minutes from the Sullivan Square MBTA station and just off of Route 93, our facilities offer accessibility and convenience for usage by organizations throughout the Greater Boston Area. We invite you to review the multitude of affordable options available for rent to serve the diverse needs of corporate and not-for-profit organizations in the area. The Town Common is best used for large functions, workplace retreats, keynote addresses, and conferences. The 2900 SQ FT space features a stage, podium, and extensive A/V capabilities including microphones, overhead projection, and a room computer. Click here for more specs and photos of the Town Common. 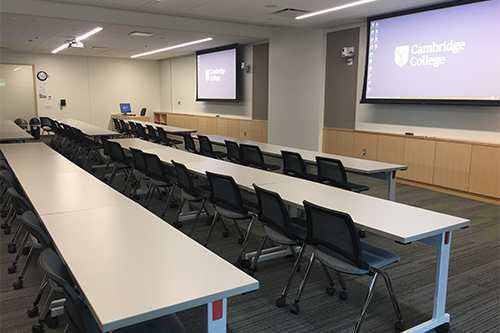 Skyfold Classrooms at Cambridge College Boston offer flexible, versatile space for meetings and workshops. Each room is equipped with two overhead projectors, two room computers, and two widescreen LED monitors. 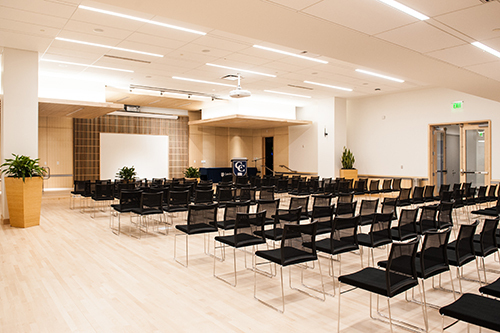 Standard Classrooms at Cambridge College Boston are equipped with overhead projection, a room computer, and flexible furniture options to accommodate a variety of academic and professional activities. Seminar Rooms offer close quarters to facilitate small group work and brainstorming sessions. Spaces are equipped with an in-room computer and widescreen LED monitor. 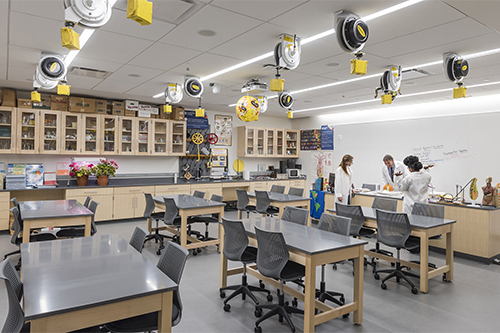 Science Labs at Cambridge College Boston feature state of the art equipment and resources for both elementary and biological-based science teachings. 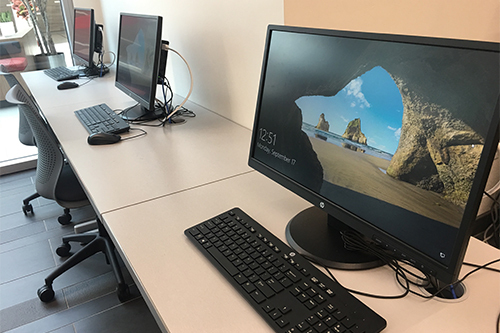 Computer Labs at Cambridge College feature individual use desktop computers equipped with the Microsoft Office Suite. Labs include an instructor computer with access to overhead projection. The above spaces are available for extended usage over a pre-determined period of time to accommodate recurring conferences, workshops, or courses. Please contact spacerentals@cambridgecollege.edu for extended use rates and details. For a comprehensive listing of nearby parking locations, please visit the Visitors Parking Information page. The above facilities are available for hourly rentals. For hourly rates, please contact spacerentals@cambridgecollege.edu. 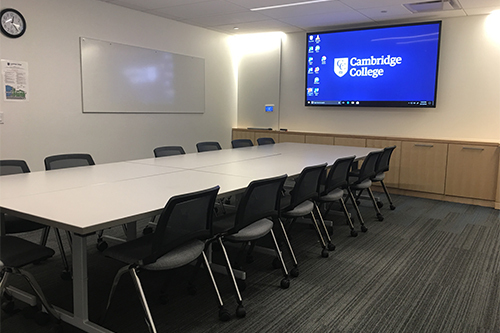 Entities interested in renting space at Cambridge College Boston are required to complete a Facility Use Agreement and must carry and maintain appropriate and comprehensive liability insurances. For more than 45 years Cambridge College has been a leader and pioneer in adult learning. With a main campus in Boston, Massachusetts, and four regional locations nationwide, we provide academically excellent, time-efficient, and affordable higher education to a diverse population of adult learners. A private, nonprofit institution, Cambridge College is accredited by the New England Commission of Higher Education (NECHE, formerly known as NEASC); our various degree and certificate programs enable students to earn the credentials they need to advance in their careers.